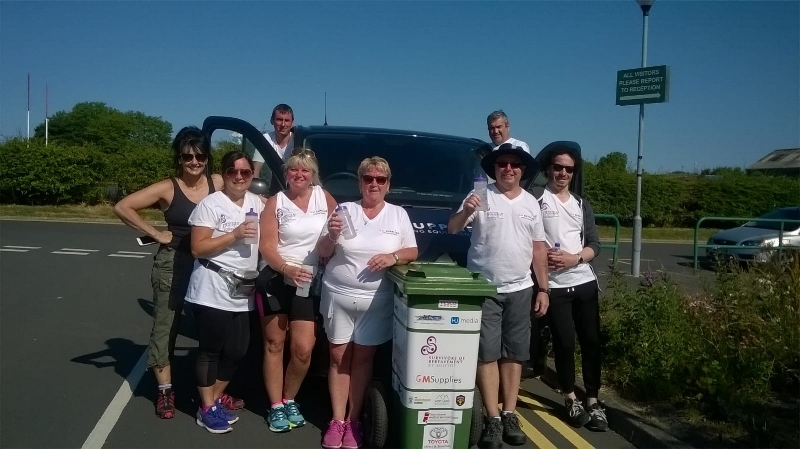 On Friday (29 June), Rosina Robinson and her team braved the scorching heat in a gruelling 20-mile walk across West Cumbria. The walk, stretching from Egremont to Workington, was a local initiative named The Wheelie Bin Challenge, an event in which participants walk across West Cumbria pushing wheelie bins to collect food donated by local schools for local foodbanks, and to raise funds and awareness of the charities chosen by the teams taking part. The team of 14 walkers – made up of Rosina’s family, friends and Survivors of Bereavement by Suicide (SOBS) volunteers – chose to support SOBS Cumbria, as each of them had been affected by suicide either directly or indirectly. Others joined them along the way to offer their support. The Wheelie Bin Challenge had been testing, but enjoyable. “It went very well. We set off fine, but we soon realised that the heat would be an issue. Soon, even walking up small slopes became difficult; quite a few people suffered with blistering. It was hot and sticky!” Rosina recalled, referring to the 28°C heat that hit West Cumbria over the weekend. GM Supplies kindly provided the team with t-shirts; it allowed its van to be used as a support vehicle and to take the food collected to the storage depot. GM Supplies also generously donated £500 to the team’s fundraising efforts. The team has raised over £1,500 so far and, although the walk is over, donations remain open. If you’d like to support the team’s fundraising campaign, visit SOBS Cumbria’s BT MyDonate donation page. Alternatively, you can choose a different method of donation here.